Kitsap Bank opened a loan production office in downtown Bellevue Monday. The office is located at 11711 SE 8th Street, Suite 310, in the Bellevue Gateway Building, near the I-405 and SE 8th Street interchange. 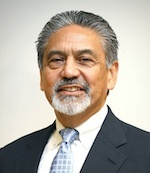 Senior Vice President and SBA Manager Paul Sabado (pictured) is managing the location. Port Orchard-based Kitsap Bank operates 21 locations in Kitsap, Jefferson, Clallam, Mason, Pierce and King counties. The new Poulsbo Safeway store will likely include a U.S. Bank branch. U.S. Bank National Association filed an application with federal controllers Wednesday for an office at the 10th Avenue Store. The Poulsbo Safeway is set to open in May. Minneapolis-based U.S. Bank has offices in the Silverdale Albertsons and Bremerton Fred Meyer, as well as an ATM in the Poulsbo Albertsons. Albertsons and Safeway finalized a merger earlier this month. We’ll be taking a closer look at what that might mean for the Poulsbo grocery stores and other Kitsap locations. Alan Crain was announced Tuesday as the new executive vice president and chief financial officer of Kitsap Bank. Crain was most recently CFO of Seattle Bank, working to rebuild the standing of the distressed institution, according to a news release. He also served 14 years as CFO of Cashmere Valley Bank. Crain is a 1987 graduate of Central Washington University and 1996 graduate of the Pacific Coast Banking School at the University of Washington. He is active in several banking and business associations. The Port Orchard-based bank maintains 20 locations and reports $900 million in assets. In related news, Kitsap Bank announced a new branch for Wheaton Way in Bremerton, to be combined with a Starbucks. Head on over to the Bremerton Beat blog for details.